Shyanne Belzer/MDN The Community Rocks Board of Directors presented checks to seven beneficiaries on Monday. In total, they presented $37,000 in gifts to the Magi City Discovery Center, the MSU Music Program, Cabo San Lucas Equinoterapias, YWCA Women and Children’s Homeless Shelter, Minot String Academy, Western Plains Children’s Choir and the Glenburn Public Schools Music Program. Shyanne Belzer/MDN The president of Community Rocks, Erik Anderson, right, and vice president and treasurer Andy Bertsch, left, were presenting the checks to the many beneficiaries of the 2019 Community Rocks event. The Community Rocks board of director’s president, Erik Anderson, and vice president and treasurer Andy Bertsch presented checks to seven beneficiaries on Monday. 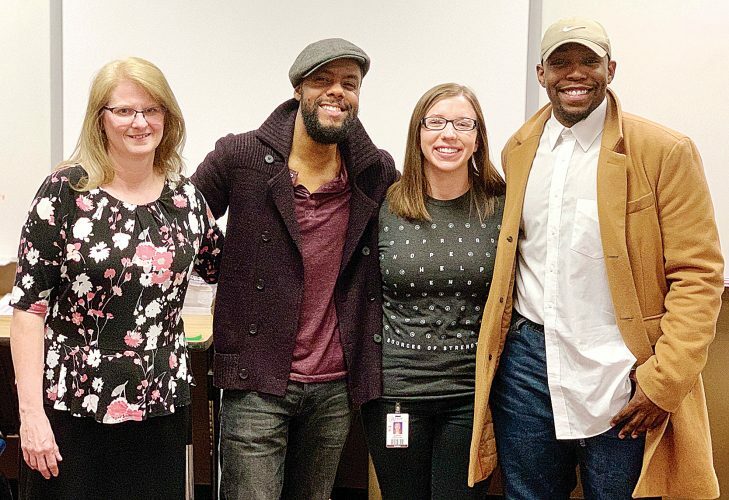 Community Rocks raised a total of $37,000 to be gifted to various groups at their 2019 Community Rocks concert in Feb. The primary beneficiary at the gifting ceremony was the Magic City Discovery Center. Community Rocks gifted them with $32,500 plus an additional $500 on behalf of Melissa Spelchen, Community Rocks vocalist, and $500 on behalf of Joe Hickel, auctioneer. In total the MCDC received $33,500 to go to sponsor a music/sound exhibit in their new facility to be built on North Hill. They were very thankful for the funds received. The Minot State Music Program received $1,000 to establish the Community Rocks Scholarship. The YWCA Women and Children’s Homeless Shelter received $500 for their volunteers. The Western Plains Children’s Choir received $500 and the Glenburn Public Schools Music Program received a check for $500. The final beneficiary was the Minot String Academy. They received $500 for their performance during at the 2019 Community Rocks event.